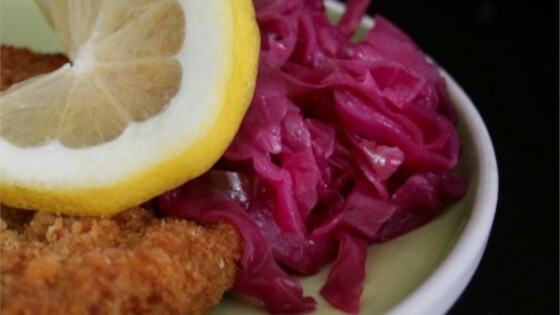 "This yummy, sweet and sour German red cabbage is easy to make!" I have been using this recipe for years. I cut back on sugar a little. Add just a touch of beer when cooking.I serve whenever I make perogies. My family loves it. "Dump all ingredients in pot and cook." Doesn't get any easier. The result captures the mild sweetness of the cabbage perfectly, the ingredients all enhance the flavor without competing. My children enjoy this dish, of course it makes this recipe a keeper.